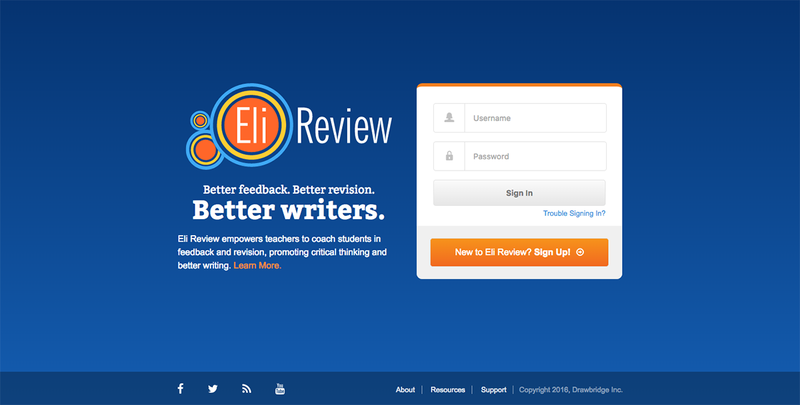 Sign up: The first step is signing up for Eli Review. You can do that by clicking “Sign Up” anywhere on elireview.com or by going directly to app.elireview.com. You’ll answer a few basic questions (name, email, password, etc). Then, agree to Eli Review’s terms of service, which lays out rules for usage, copyright ownership, and other typical provisions. Join a course: Enter the course code provided by your instructors in the box. Once you’ve joined, you’ll see the name of that course on the dashboard, and you can click it to enter. You may be prompted to purchase a subscription in order to participate in the course. If your school purchased Eli subscriptions for you, or if your instructor is participating in a free trial, you won’t need to pay to participate. Course homepage: Once you’ve joined a course and clicked on its name from your dashboard, you’ll go to the homepage for that course. The homepage lists your assigned work in chronological order. Active tasks appear at the top, and completed or archived tasks appear at the bottom. Click on any task to view it or to work on it. Now that you’re signed up and joined a course, you’re all set to start working on your writing, review, and revision tasks. 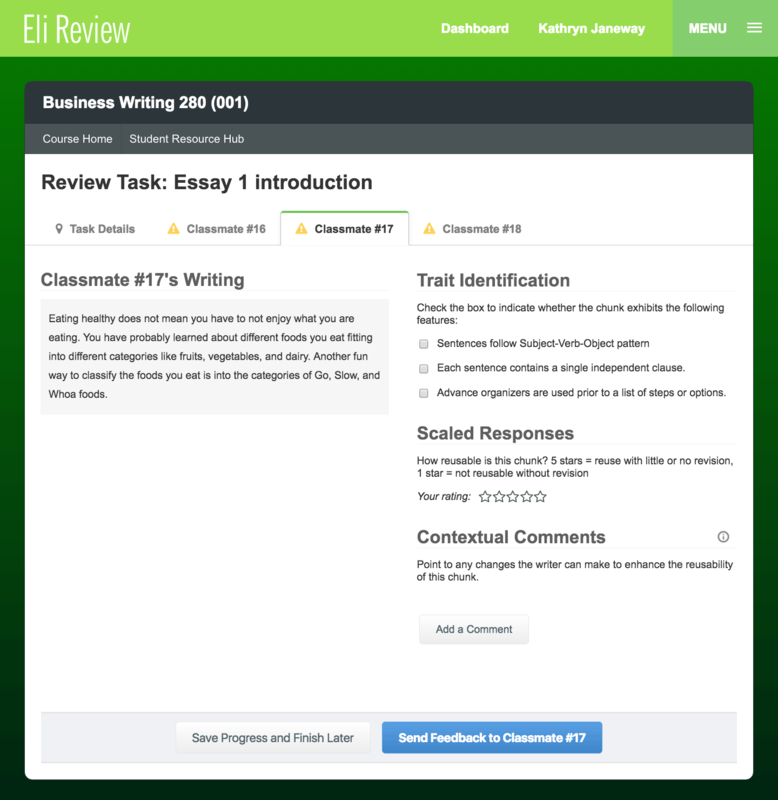 Your work in Eli Review begins with a writing task. 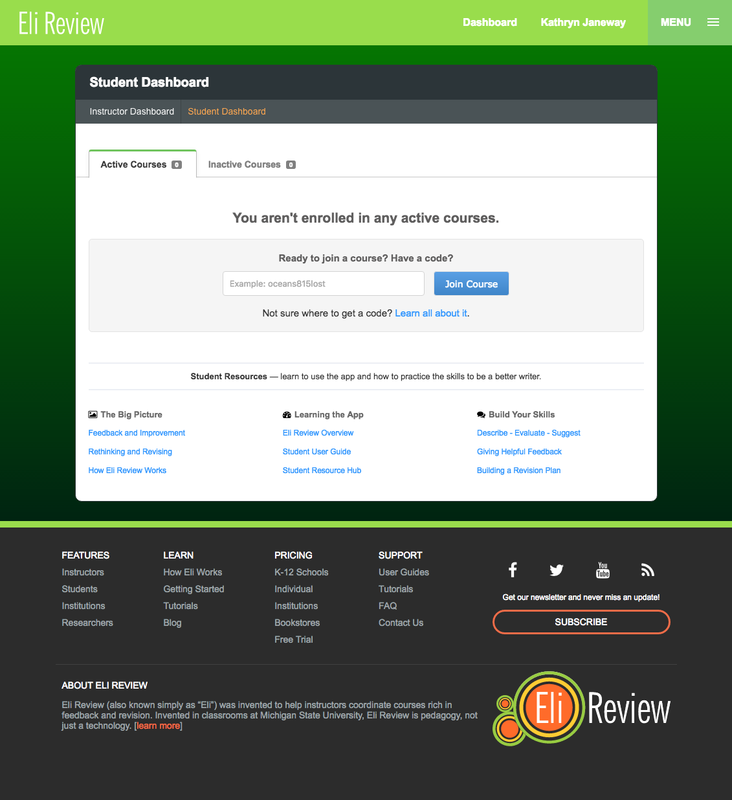 Submitting your draft in Eli starts the process where you’ll get feedback and revise. 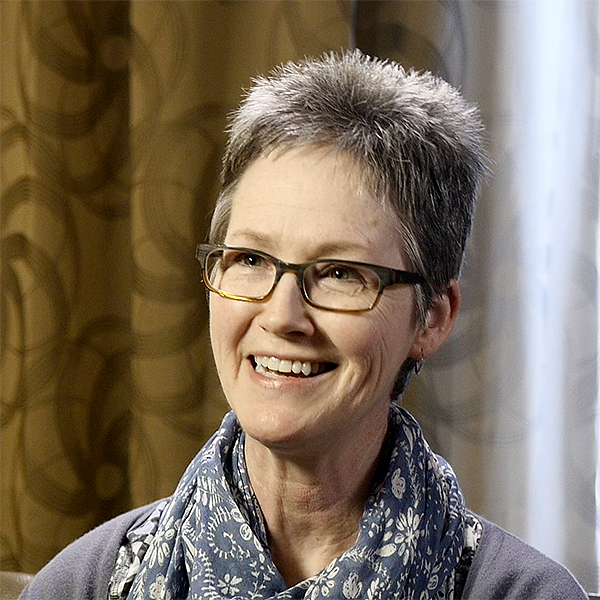 There are two ways your instructor might ask you to submit a writing task: as text or as a file. If you submit text by copy/pasting or by importing, be sure to review your writing before submitting – neither method is perfect and formatting is sometimes lost, so double check and make sure everything looks right. 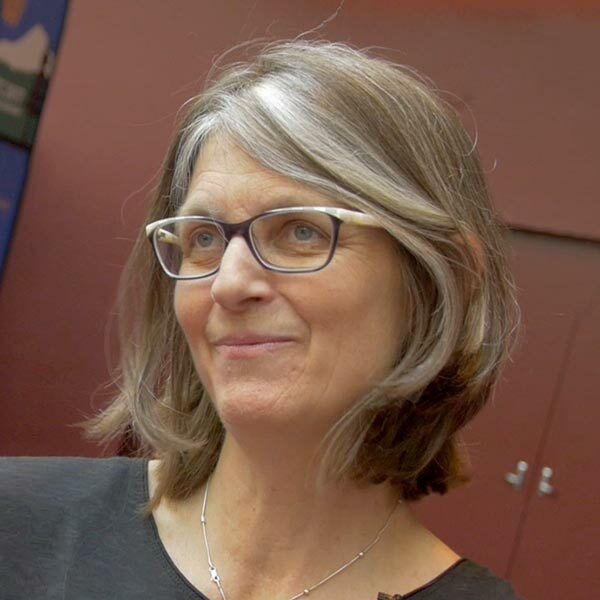 Check out our four tips for preserving your formatting. If your instructor asked you to upload a file, instead of the WYSIWYG editor you’ll see a button labelled “Choose a File to Upload”. 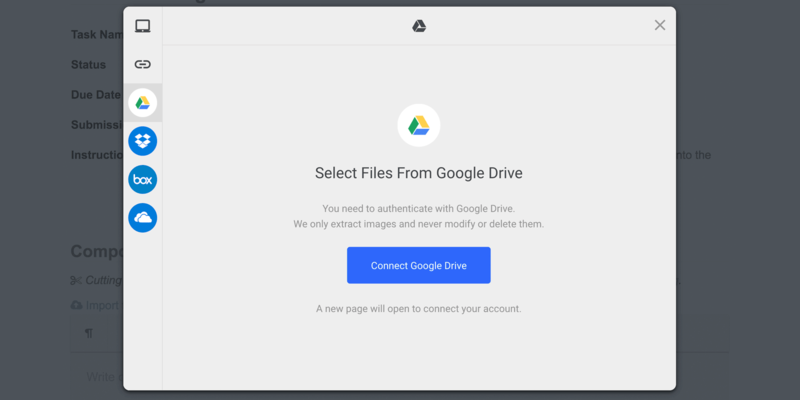 Clicking that button will open a window like in the screenshot above that will allow you to choose a file from your computer or one created in another app (Google Drive, Dropbox, etc). File types: you can upload documents (doc, docx, pdf, txt), images (jpg, png, gif), slides (ppt, pptx), and spreadsheets (xls, xlsx). Don’t put your name or other identifiable info in your writing. Your instructor may assign your writing to an anonymous review, but it won’t be anonymous if you put your name right in your document. Consider writing in Word or TextEdit and then pasting into Eli. If your Internet connection is unstable or if your browser crashes, you can lose work. Rather than risk it, type your draft in word processing app that saves to your computer first. You can make last minute changes. You can edit your draft or upload a new file until the due date. 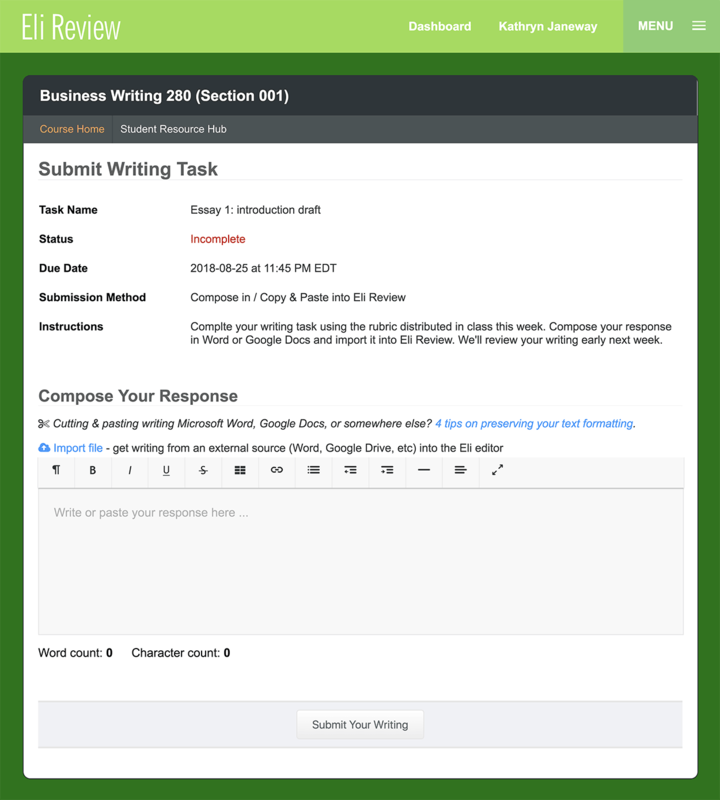 You can get complete details about writing tasks in the student user guide. The better you and your peers get at giving helpful feedback, the better feedback you and everyone else gets. Review tasks make it easy for you to improve as a reviewer and to tell reviewers if they’re giving you what you need to revise. An incomplete review task shows the survey-like review task designed by your instructor. It will help you focus on a few criteria as you review your peers’ work. The questions will vary, but you might be asked to complete a checklist, rate using stars or by picking the best description, or add comments. Remember that writers use the feedback you give when they plan their revisions. Be sure to answer each survey question and, in your comments, be respectful as you point out how writers can improve. Important Note: Once you send feedback to your peers, you can’t make changes to it. It’s like an email: once you click the send button, you can’t call it back to make changes. Eli will warn you about this when you say you’re ready to send, and give you a chance to back out, but once you’ve sent your feedback, the task is complete. Once you’ve finished giving feedback to your classmates, your work giving feedback is complete. You’ll then have access to the “Feedback You Received” report. 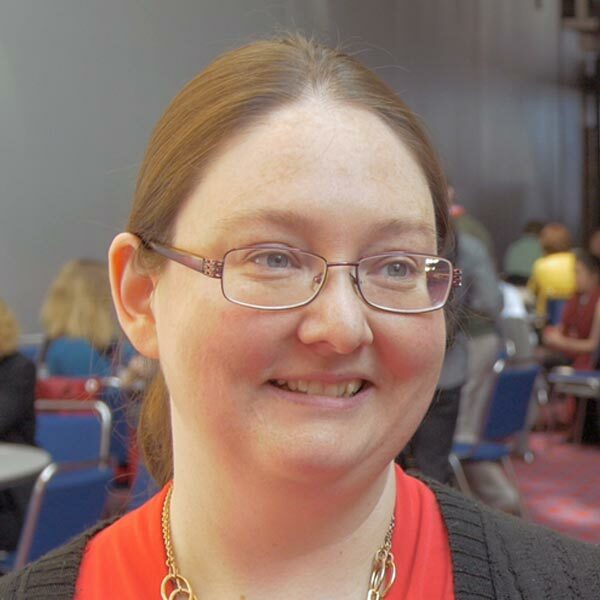 You might see checklists and ratings showing what percentage of your reviewers thought you met the criteria as well as the class averages on those criteria. You’ll also see explanations for some ratings and a list of all comments. 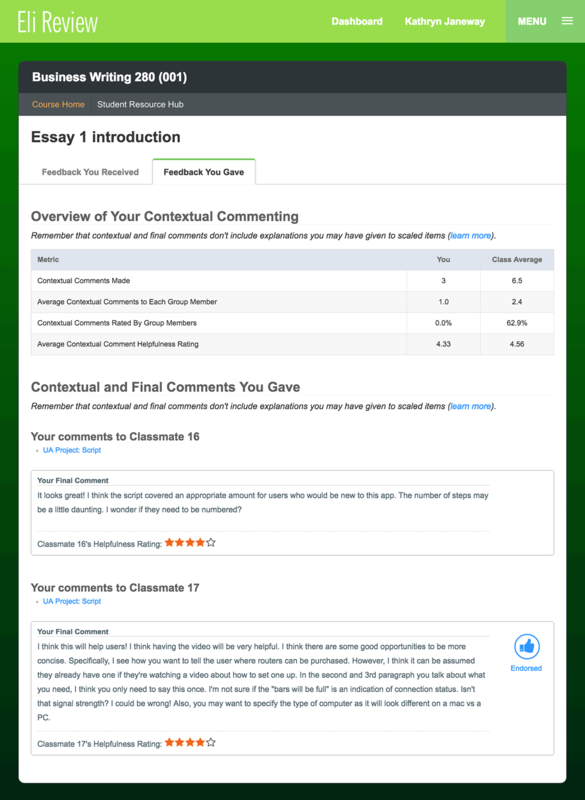 Helpfulness ratings let you rate the comment for how much it will help you revise. 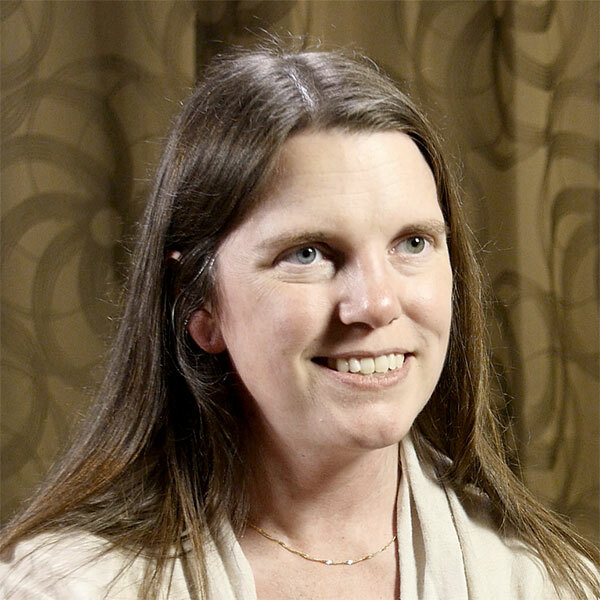 Your instructor may give you guidelines for how to rate comments or refer to Eli’s guidelines. These ratings tell reviewers and instructors if you’ve gotten what you needed from peer feedback, so be “stingy with the stars” in order to get better feedback next time. Add to revision plan copies a comment you’ve received in a review task and puts it in a revision plan for your writing task. You pick which writing task you are revising, and then you can add a note to yourself and your instructor explaining how you are going to follow your peers’ advice. There’s more to a revision plan; for now, choose “Return to review” so that you can keep working through the comments you’ve received. Endorsed comments have been giving a thumbs up by your instructor. Make sure you pay attention to these comments and add them to your revision plan. Between ratings, criteria, and comments, the “Feedback You Received” report includes a lot of information about whether your draft meets the criteria and how to improve it. Accepting feedback can be hard, so make sure you go into it with a growth mindset and read through the feedback a couple of times. 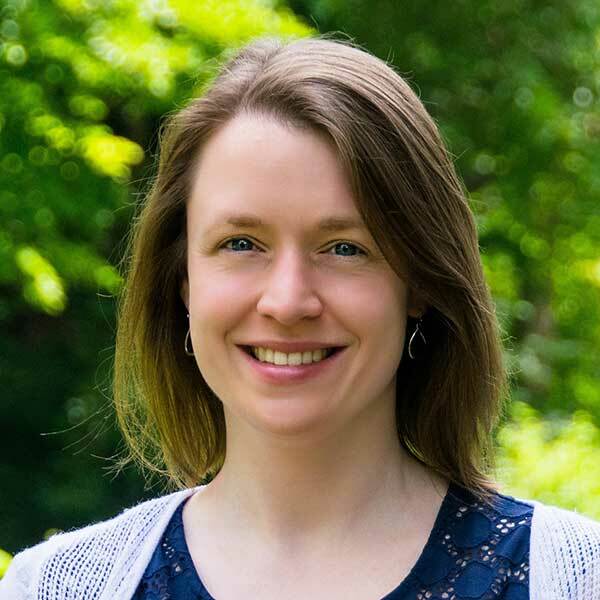 Recognize that the comments you’ve received will help you develop an effective revision plan and ultimately a better revision. A completed review task also gives you access to the “Feedback You Gave” report. It helps you gauge your effort and helpfulness as a reviewer. You’ll see how many comments were exchanged, how helpful they were rated, and how your ratings compare. You’ll also see a list of all of the comments you gave. 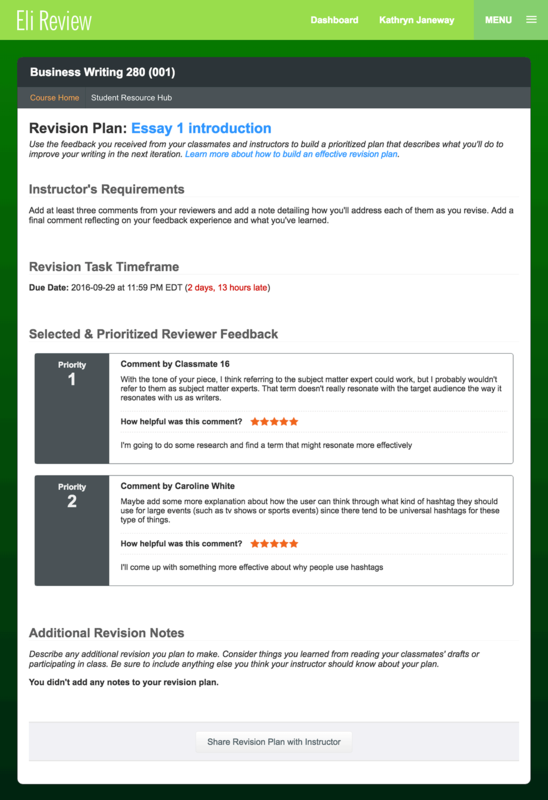 You’ll see how your classmates rated each comment, whether or not they added it to their revision plan, and whether or not your instructor endorsed it. Reflecting on the comments you give–what you point out and how respectful you are–can help you get better at giving feedback. Revision is where everything comes together. You’ll use the feedback you received during a review task to improve the work you did in a writing task. Real writing improvement happens in revision, so this is the most important stage in the cycle. revise and resubmit your original draft using the revision plan you developed. Your revision plan is where you lay out your priorities for the next draft. It’s a private note for you that can be “shared with instructor” if required. Your priorities come not only from the specific comments peers gave you but also from all the other experiences you’ve had in class. As mentioned previously in the section on using feedback you received, you can build your revision plan first using feedback you received from your peers. 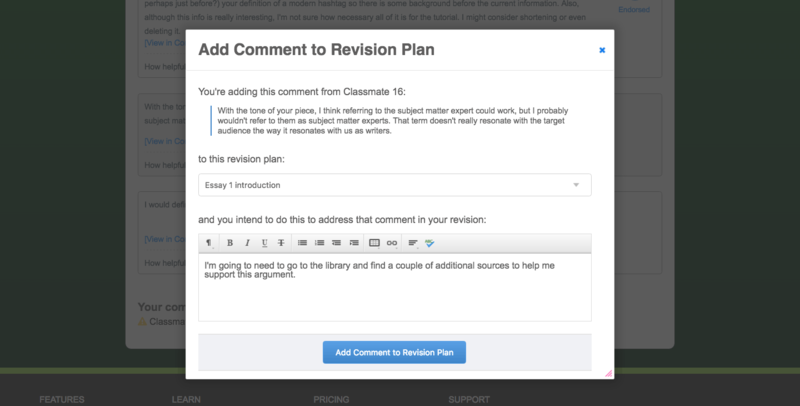 When you view your revision plan, you’ll see all of the comments you added, in the order in which you added them. Rearrange these comments by dragging and dropping them in priority order for your revision – #1 should be your most important item, #2 your second, and so on. Also, continue adding notes to each comment. If your instructor has included a revision plan prompt, make sure to address those specific questions in the note space. This is also the space to add any revision goals you have based on reading others’ drafts, discussing exemplars in class, or from your instructors’ debriefing of a review. When you’re done, click the “Share with Instructor” button, if required. You can continue making updates until the due date has passed. Check your completed revision plan tasks to see if your instructor adds a note back to you on your priorities. It will be included at the bottom of the revision plan page. After you’ve completed a revision plan and perhaps received your instructor’s feedback, you’re ready to revise and re-submit your work. That’s it! 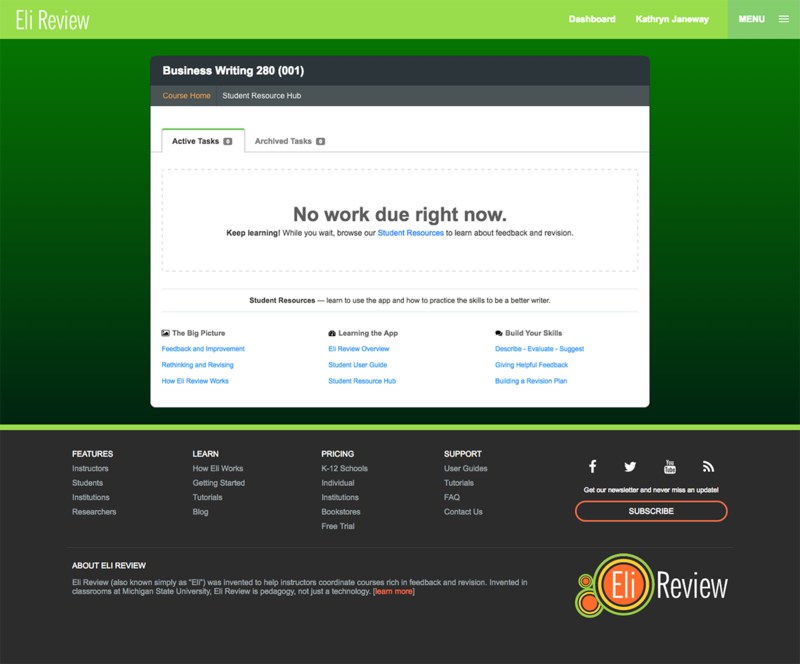 You’ve completed a write-review-revise cycle in Eli Review. 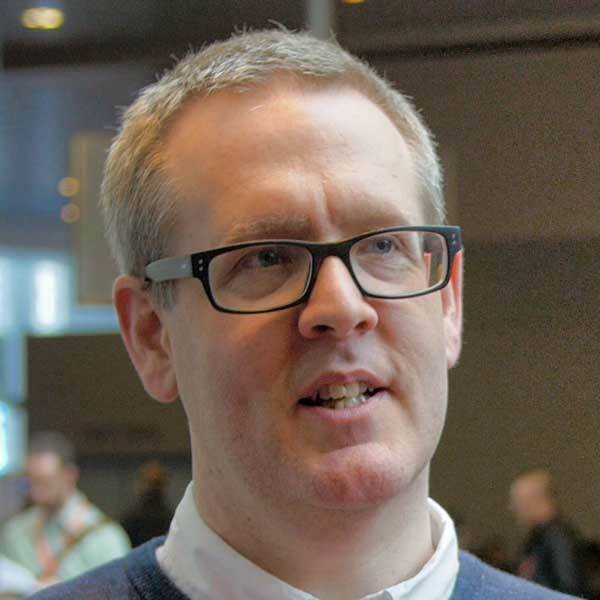 You’ll hopefully be asked to do many cycles, and you’ll give and get better feedback with each one.